Dr. Rebecca Hardcastle is originator of the concept of Exoconsciousness. This is the study of extraterrestrial dimensions of human consciousness: the processes, abilities and physical endowments that link us directly to the cosmos and its inhabitants. Though not formally acknowledged by scientific and religious institutions, Exoconsciousness is an emerging field of historic and scientific research that will accelerate as the human species' self-knowledge parallels its technological achievements. As a dedicated student of Tibetan yoga, meditation, shamanism and hypnosis, her beliefs were profoundly expanded when she began to acknowledge and experience extra-dimensional communication and awareness. A passion for understanding led her to pursue academic and independent research on extraterrestrial contact and consciousness. 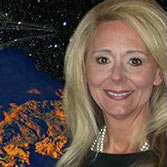 She has the privilege to be mentored by Dr. Ruth Hover, researcher of anomalous phenomenon and ufology pioneer. Dr. Hardcastle teaches Extraterrestrial Reality at Scottsdale Community College in Scottsdale, Arizona. She also offers customized training programs and workshops. Respected as a UFO/extraterrestrial expert by a local television news affiliate, she has also been interviewed on radio and television. She is featured in the film documentary, The Phoenix Lights. Her formal education in philosophy and religion commenced at Otterbein College in Ohio. She then traveled to Basel, Switzerland to concentrate on continental philosophy. She holds a Master of Divinity in philosophical theology from Boston University and a Doctor of Philosophy in parapsychic science from American Institute of Holistic Theology. She is ordained in the United Methodist Church and is dedicated to introducing Exoconsciousness and ufology to the religious sector. Professionally, she served as ecumenical chaplain at Wright State University and Sinclair Community College in Dayton, Ohio. During her assignment, she was appointed a director of national and local United Methodist church agencies. Dr. Hardcastle also maintains a private practice as a holistic hypnotherapist/life coach. A lover of the arts, she co-founded a jazz-oriented art non-profit in Arizona. At East Valley Institute of Technology in Mesa, Arizona, she facilitates school-to-career transition programs with major corporations, small businesses and trades in the Phoenix area. Through her exoconsciousness work, Dr. Hardcastle is committed to preparation for peaceful co-existence and communication with extraterrestrial communities and inter-dimensional life. Her principle website is www.exoconsciousness.com. Dr. Hardcastle is a former member of the faculty and of the Advisory Board of the Exopolitics Institute.